A tech cool-down and a lingering hangover from the March 22 yield-curve inversion couldn’t prevent the US stock market from wrapping up one of its best Q1s on record: a 13.07% S&P 500 (SPX) return that marked the index’s biggest January-March gain since 1998, its sixth-biggest since 1950 (tied with 1986), and its best three months—period—since 2009. The SPX will kick off Q2 this week around 4% below its all-time high, having erased more than 80% of what it lost during its September–December sell-off. And while cautious traders may be looking for the market to pull back a bit after such an impressive run, history indicates strong first quarters typically end up being positive years. Sector action: The top-performing S&P 500 sectors last week were industrials (+2.7%), materials (+1.9%), and consumer discretionary (+1.8%). The worst-performing sectors were utilities (-0.61%), communication services (-0.57%), and real estate (+0.8%). Highlight reel: Communications equipment provider Avaya Holdings (AVYA) surged 33% on Monday amid reports it was considering a leveraged buyout from a private equity firm.1 On Tuesday, Bed Bath & Beyond (BBBY) jumped +22% as activist investors pushed sweeping changes at the retailer.2 Home furnishings had a rough week: At Home Group (HOME) shares tumbled -22% on Wednesday in the wake of an earnings miss, while RH (RH) fell -21% on Friday after the company painted a picture of a slow 2019..
On Friday, ride sharer Lyft (LYFT) began its life as a publicly traded company at $87.24—about $25 higher than its projected price from a couple of weeks ago—before closing at $78.29 (+8.7%). Futures watch: After moving sideways for much of last week, May WTI crude oil (CLK9) rallied more than 1% on Friday, closing out its best quarter in a decade back above $60/barrel. April gold (GCJ9) suffered its second-biggest down day of the year (-1.4%) on Thursday on the way to settling Friday around $1,292/ounce. Pushed by the decline in long-term interest rates, June 10-year T-note futures (ZNM9) rallied to a new contract high just shy of 125 before retreating a bit on Thursday and Friday to end the week around 124.25. I don’t see a US recession as particularly likely. The US is certainly experiencing slowing growth—that’s something that was long expected. April by the numbers. 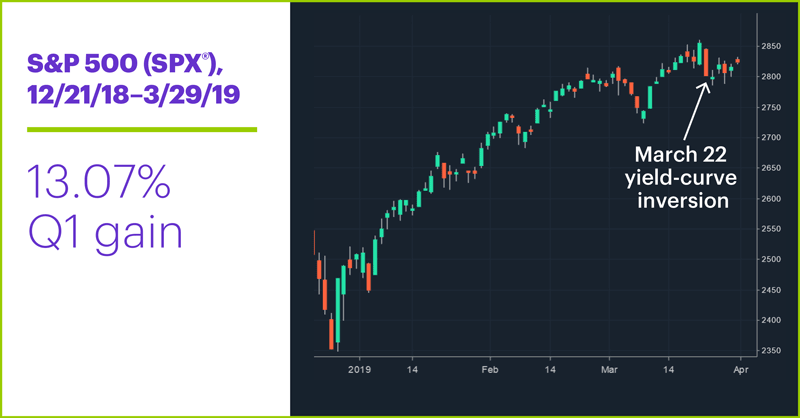 While “The yield curve–stock market showdown” noted the potential for April to be a little weaker than usual following exceptionally strong Q1s, April has traditionally been one of the more reliable bullish months of the year. Since 1960, the SPX has gained ground in April 71% of the time—a monthly winning percentage that trails only December. Nine out of the past 10 Aprils and 15 of the past 20 have been in the plus column. 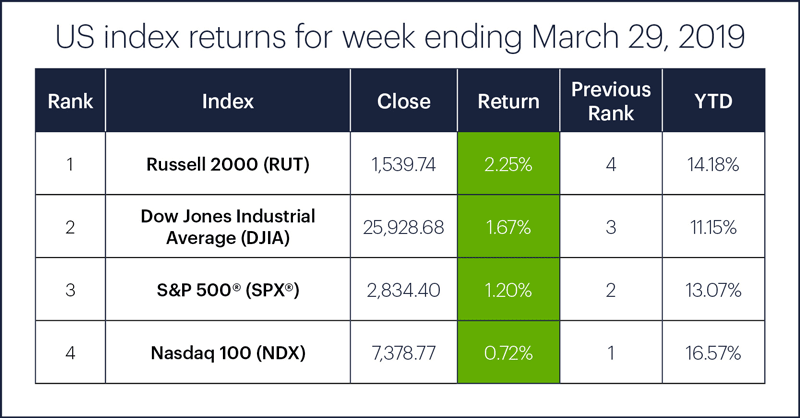 April has tended to start with a pop, too: The first trading day of the month (today) has closed up 59.5% of the time, while the second has closed up 63% of the time. 1 TheStreet.com. Avaya Soars on Report It's Considering a Leveraged Buyout. 3/25/19. 2 Barron’s. ‘Better Late Than Bankrupt.’ Bed Bath & Beyond Is a Ripe Target for Activist Investors. 3/27/19. 3 Financial Review. Janet Yellen says US recession is unlikely. 3/25/19.